Sherotech: If you try to access Facebook chat on your Facebook app, you are forced to install a separate app for Messenger. A similar message is now being shown to some users who are accessing the social network in their mobile web browsers. Facebook is justifying the move by calling it a move to bring “best experience” to the users but the overall picture being painted here doesn’t look pretty. ust when you recovered from the shock of not being able to use chat in your Facebook mobile app and forced to install Messenger app, Facebook is here to push you harder. According to the recent reports, Facebook has become more aggressive, making it impossible to use Facebook chat on a mobile device without installing a separate app for Messenger. This news could be disturbing for millions of people who choose to access the social networking website via its mobile site because they don’t want to download two different apps for Facebook and Messenger. This hostile move by Facebook could be justified by the company with many excuses like “more focus on Messenger”, “its growth as a platform”, or “more power and best experience to the users”. But, the overall picture being painted here doesn’t look pretty. Facebook has realized that just like the growing advertising business of Facebook app, its Messenger platform has the potential to become a golden hen and add value to Facebook stocks. Facebook knows that people are addicted to its services and they can’t afford to leave the platform .Something similar was recently said by The Pirate Bay founder who labeled Mark Zuckerberg as the dictator of Facebook nation. At this point, one could simply expect that this trickery remains confined to mobile devices and doesn’t enter the desktop world. 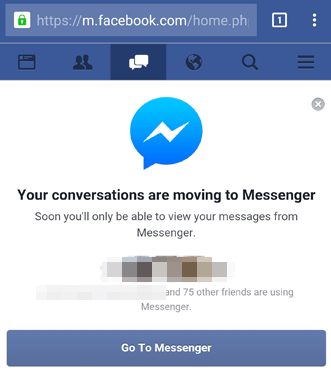 A separate website for Facebook Messenger is already present and you can access your chats separately on the desktop. If you are unwilling to install another battery-hogging app on your device, go ahead and give Facebook Lite a try, which still allows you to access chats.